Treat your near and dear ones in an exclusive way with this Premium Quality Preserves North Indian Dinner Gift Hamper and make them feel very special. 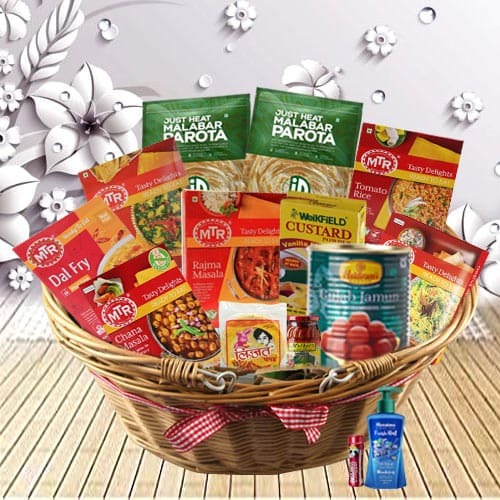 Packed with Excellence; quality; good taste; sophistication and style; this Basket contains Weikfield Custard Mix, Water Himalaya Fresh, Mothers Mixed Pickle, Mouth Freshener Pass Pass, a Punch of Id Just Heat Malabar Parota- 2 Pcs. 350 Grams, a Carton of MTR Ready To Eat Tomato Rice 300 Grams, a Carton of MTR Ready To Eat Rice Pulao 300 Grams, a Carton of MTR Ready To Eat Alu Methi 300 Grams, a Carton of MTR Ready To Eat Dal Tadka 300 Grams, a Carton of MTR Ready to Eat Rajma 285 Grams, a Carton of MTR Ready to Eat Pindi Chana 285 Grams, a Tin of Haldirams Gulab Jamun (1 Kg.) and a Punch of Mini Lijjat Papad 200 Grams.